Westmont Junior High School, District 201, has a dynamic summer school program which offers a variety of fun and engaging classes. Startalk, which is a Chinese Immersion program, was a popular class selection that satisfied a growing need in the community. The positive and encouraging comments and reflections from families and students at the closing ceremony, make the Startalk Chinese program a very likely return to next year’s summer program schedule. “For the very first time, we are pleased to extend the Startalk Chinese Nurture Student Program to Westmont, IL this year. It is a great opportunity for the school district students to benefit from an immersive Chinese program,” Startalk Program Director Fred Lu said during the closing ceremony performance on July 7. The closing ceremony featured colorful lion costumes, drums, dancing, singing, humorous skits and Chinese kung fu demonstration that left the audience – Westmont Mayor Ron Gunter, School Superintendent Kevin Carey, Westmont Chamber of Commerce and Tourism Bureau (WCCTB) Executive Director Larry Forssberg, Taipei Economic and Culture Office in Chicago Culture Center Director Wei-Zan Wang , Overseas Community Affairs Council Republic Of China (Taiwan) Virginia Shen and parents impressed. 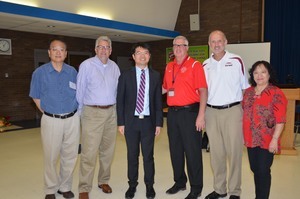 “I am very happy that Westmont Junior High School can host the Startalk Chinese program this summer. Westmont has been seeking a deeper relationship such as to have a sister city with Taiwan. This program strengthens the mutual relationship,” said Westmont Mayor Ron Gunter. Such a quote shows the prestigious decision has elevated Chinese learning experience to another level. “To my surprise, my son Dominic comes home every day from the program and tells me how much he enjoys the program. It is unbelievable to see that he can communicate in Chinese so much and make a lot of new friends. It’s a very enjoyable program to include the culture, the language and the writing” said Mrs. King. “This has been my fourth year in Startalk. I love it and never want to leave until Startalk kicks me out,” said Abagail Goodman, a student of Startalk Track 2. “We fall in love with this program. Our thanks to Westmont for hosting this year and we are very glad that the program can continue offering this wonderful Chinese learning opportunity for my child. The outcome is pleasing. We plan to come back next year,” said Mrs. French. Startalk is a U.S. government funded research program, conducted by the Consortium of Illinois Language School. Startalk Chinese Nurture Student Program is offered at five sites in the Chicago area. Startalk has offered intense and standard based Chinese immersion language program to over 1,300 students in 15 school districts since the year of 2009.